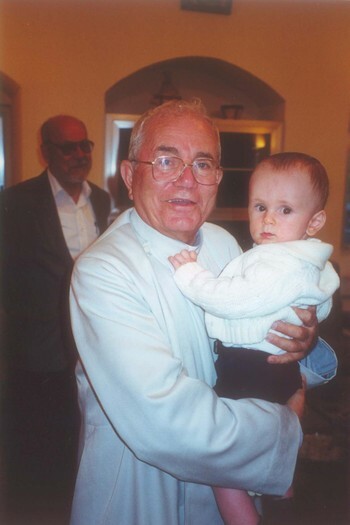 Bishop Salim Ghazal holding my son, Joseph, in the monastery of Deir MKhalles, September 2000. 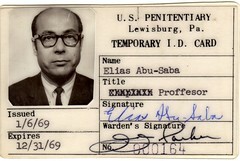 My late father, Elias Abu-Saba, is in the left background. We had just visited with Father Salim during his Sunday tea hour, and he was about to go down to dinner with the brethren of his order, of which he is still the Superior. This blog gets about twenty referrals a day from search engines, in which people look for images of Bishop Ghazal. His tour of the States must be prompting all the activity. Here's hoping they all try again and find what I believe is the only close up portrait of the Bishop on the Internet. My father lived for two decades in Greensboro, NC, where he taught architectural engineering at North Carolina Agricultural and Technical University (A&T). After he and my mother moved to Beirut in the early 90s, they continued to use Greensboro as their home base in the States for another decade. During those years Dad wrote and read lots of poems! He attended many public readings in Greensboro and was active in the community. No party was complete without one of Dad's poems, often composed on the spot and inscribed on a paper placemat or styrofoam cup. Now his work is being celebrated as part of Greensboro's month-long poetry festival. It appears that a dozen of his friends are going to read his poems on April 23. Mom has just asked me to choose my favorites from his enormous oeuvre. If you click on the link, you'll see a handsome photo of him in his beret and a tweed jacket. Dearest Daddy! I still miss him.